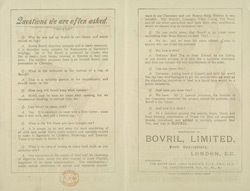 Bovril was first advertised in 1886. A butcher and teetotaller from Edinburgh, John Lawson Johnson developed a mixture which he called ‘Fluid Beef’. He advertised it as a healthy alternative to alcohol and it was especially popular with the elderly and invalids as it was an effective means of building up their strength. He opened a factory in London in 1886 and produced a more concentrated version of the drink. He called it Bovril and although water could still be added he encouraged people to spread it on bread and eat it like a jam.